‘Sadabahar’ mango developed by Mr. Kishan Suman,52, is the only mango variety in the entire world that yields fruit for the whole year! “I have invested my 19 years to develop this variety by working consistently only for the zeal that mango, ‘king of fruits’ should be available for the entire year. The taste is quite close to alphonso mango. The pulp is deep orange in colour and has less fiber,” he states. Grafts of Sadabahar mango grow easily and respond well to the natural farming practices. “I use only cow based manure and natural decoctions as farming inputs. I never use any chemicals.” Being a unique innovation it is being planted at Mughal Gardens of the Rashtrapati Bhawan. Mr. Kishan is based at Kota, Rajasthan. Mr. Kishan started farming in 1995. “This is our ancestral farm. After completing my education I took up farming. Following the footsteps of my father I was growing cereals and grains in the farm but it was loss making crops due to price exploitation from traders and unpredictable climate change. Thereby I cultivated rose and jasmine. Having a strong quest to learn and do something different I learnt grafting and developed the rose plant which can produce different coloured roses in the same plant. My experiments were successful and it gave immense boost to my confidence,” he shares. 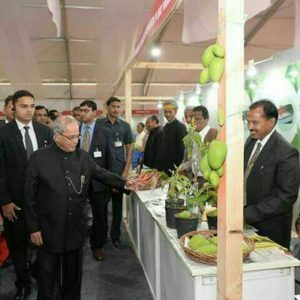 Next he thought to work on mango fruit because majority of Indians simply adore the fruit but it is available only for 2-3 months in a year. “I wanted my countrymen to relish the fruit round the year. 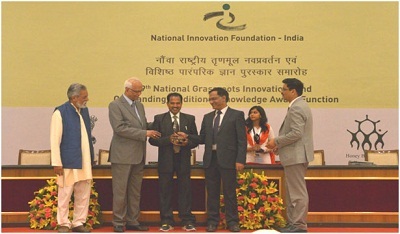 Thereby I started working on developing a new variety of mango that can yield fruits for the entire year,” he says. 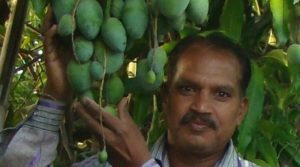 With consistent grafting, Mr. Kishan was able to craft dwarf mango variety ‘Sadabahar’. As it is dwarf variety it is ideal for high density farming or even ultra high density farming. “I have worked with utmost sincerity and commitment on this mango variety. It yields fruit minimum three times in one year,” he asserts. Once grafted, Sadabahar starts yielding mango fruits from 2nd year itself irrespective of any climatic changes. It is also resistant to diseases and other major disorders commonly found in the mango trees. “Although the plant starts yielding from 2nd year yet it is recommended to allow the plant to grow till four years enabling it to get the required strength. Post four years the fruits can be harvested but till then drop the flowers and allow the sapling to grow well,” he affirms. Mr. Kishan started selling the grafts and plants of Sadabahar mango after the formal launch in March 2017 along with the assistance from National Innovation Foundation. The variety now awaits patent in the name of Mr. Kishan Suman. “I am thrilled that my efforts of 19 years are being recognized and appreciated,” he proudly shares. He develops the plants at his farm in Rajasthan. At the moment he has 22 mother plants and 300 grafted mango plants. “I have already sold more than seven hundred grafts to farmers in Andhra Pradesh, Chhattisgarh and Haryana. I am getting good bulk orders from the farmers who want to grow this variety in high density farming. In this the yield expected is 5-6 ton per hectare,” he shares. The price varies as per the age and size of the plant. It begins from Rs. 500/sapling. It takes approximately three months to develop each sapling therefore pre-booking the order is preferable. In future Mr. Kishan wants to experiment on jackfruit. “All over the country people like jackfruit quite a lot but it takes very long to yield fruit. I want to reduce this time! Horticulture is a very interesting profession and for me it is like an ocean that extends immense space for fulfilling my creative quotient by working on various plants and inventing new varieties,” he sings off. Village Girdharpura, Ward No. 1, Taluka Ladpura, District Kota, Rajasthan.